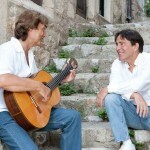 Buco and Srđan will celebrate 40 years of their work on August 31st 2012 with the concert on the terrace of the Revelin fortress at 09:00 pm. 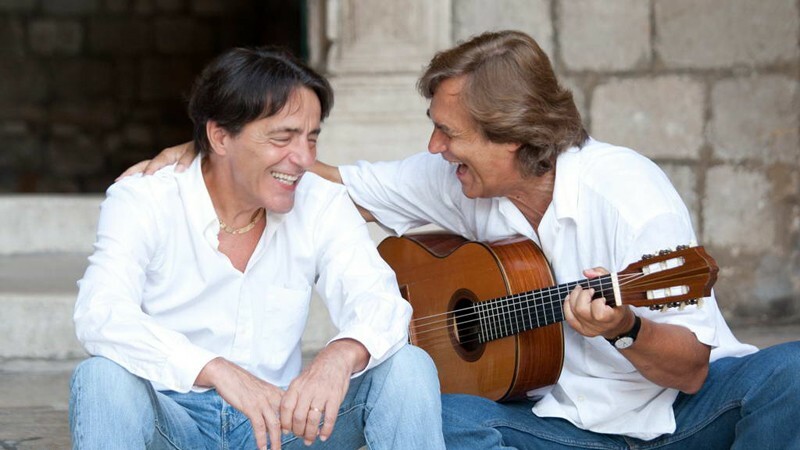 Ljubomir Pende Buco and Srđan Gjiivoje started their cooperation as duet that had tendency to chansons, in early 70’s to be more precise in 1972. 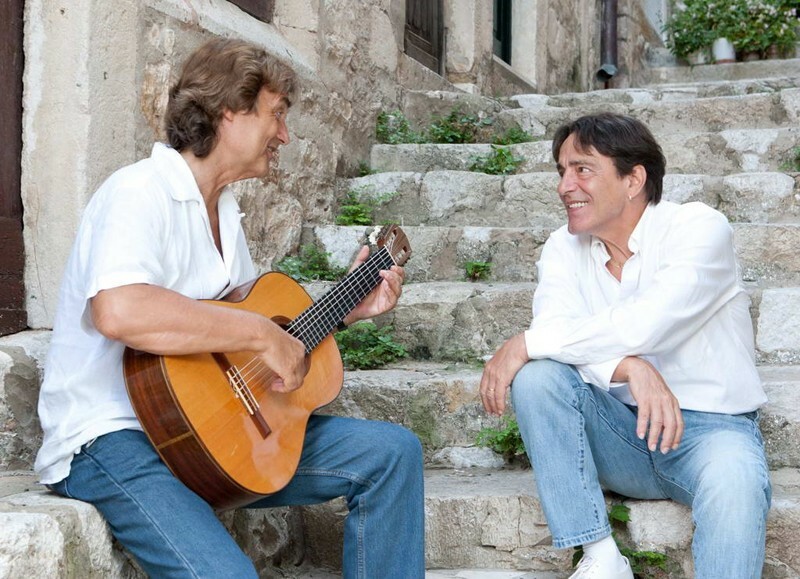 Before their joint career, they were both outstanding members of Dubrovnik music scene as part of the well known local bands and Srđan also being a member of Linđo Folklore Ensemble. Buco, as painter and singer together with Srđan as expert player of classical guitar and singer, with their vocals made something really simple yet very emotional. With the time they were accompanied with renowned pop and rock musicians and even the symphony orchestras. 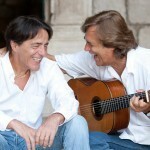 Their biggest success was with the debut album from 1974 entitled “The evening is our friend” (“Veče je naš prijatelj”) authors Buco Pende and Đelo Jusić. The most popular songs from that album were “Once we say goodbye” (“Kad se jednom rastanemo”), “My Annabel Lee” (“Moja Annabel Lee”, text A. E. Poe) and “Cvijeta Zuzorić”, text written by Milan Milišić. Musical tendencies of the second half of the 70’s were not close to their sensibility therefore their activities are slowed and their second album LP “Summer in the City” (“Ljeto u gradu”) was unnoticed. Ljubomir Pende with guitar player Frano Matušić and keyboard player Zoran Proročić, are naming the band „Buco and Frano“ and record another LP simply entitled ” A dreamer” (“Sanjalica”) (Sarajevo disk 1983). Beginning of 90’s both Srđan and Buco are leaving from Dubrovnik; Buco goes to Germany and Srđan in the US, where he still lives. During his stay in Germany, Buco made 2 solo projects in English – “The breath and sounds of Dubrovnik” and „The Dreamer”. His latest project named “Stories from the City” („Pripovijesti iz Grada” ) is completely his authorial solo album. Their come back was marked with 2 concerts in 2007 as part of the Midnight program of the Dubrovnik Summer Festival, and at the same time they are publishing some of their prior work on the compilation CD. Countless performances and TV shows, midnight recitals in Sponza Palace and recor’s palace have contributed to the fact that they were one of the best acoustic troubadour duo ever that left as their legacy numerous single records and songs that are still sang toda.